Fulton vertical tubeless boilers offer efficiencies up to 80%, and can be ordered with oil and/or gas capabilities with low emissions burners (gas only). 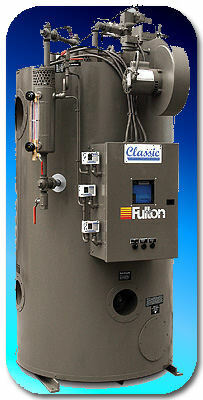 All Fulton boilers are completely trimmed, packaged boilers. No additional fuel train items or electrical wiring is needed. All of the time proven benefits and design features of the Classic Vertical Tubeless Boiler have been maintained in The EDGE, but with the addition of the Fulton engineered FGE (Flue Gas Enhancing) system you can cut your fuel bills in half. Using a massive heat transfer surface, high velocity flue gases travel over a cylindrical grid of heat convection fins. These fins radiate additional heat evenly to the outer side of the water vessle resulting in efficiencies up to 84% while still maintaining the pressure vessel's longevity.